for the Harmonious Development of People and Society"
• Efficiency of Paneurhythmy Training with the Program "Healthy by Exercising in Nature". • "Healthy by Exercising in Nature" Program: an Option for Free Education in Present Day School. • The Sun Image in Bulgarian Mythology, Folklore and Paneurhythmy. • Efficiency of Paneurhythmy Training for the Emotional, Cognitive and Social Functioning at Pre-School Age. • Effect of Paneurhythmy Training on Self-Estimation and Personality Development of Pupils from First to Sixth Grade. • Effect of Paneurhythmy Training on Inter-Personal Relations in Primary School Age. • Effect of Paneurhythmy Training on Psycho-Emotional States and Anxiety of Pupils from 1st to 6th Grade. • Specializing to Teach Paneurhythmy: Efficiency, Possibilities and Program. • Optimizing Heart Activity through Paneurhythmy. • Paneurhythmy: a Possibility for the Harmonious Development of the Body in Senior Age. • Paneurhythmy as a Music Therapy. • Quantity Content Analysis of the Paneurhythmy Text. • Influence of Paneurhythmy on the Development of Self-Assessment. 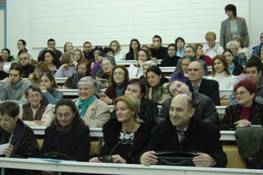 • Uchitelsko delo (Sofia): 31/ 22.10.2001: "Universal Method for Education"